About ten years ago I was taking my family on vacation to San Diego. Sunny San Diego, beaches, and sun for a week were all I could think about. When we arrived, the sun was hiding. In fact, for July, San Diego was experiencing record lowtemperatures, somewhere in the fifties and sixties. Our friends out there were telling us all of the other fun things to do, to which I replied “ I live in Kansas, I am1500 miles from a beach in either direction, I am going to the beach.” So I went, and my family did as well. No one else in San Diego, however, was at the beach. Although cool, it wasn’t freezing cold out, and I just stared in amazement at the ocean, something a Midwesterner rarely gets to do. Often seeing the same thing every day the mystique goes away, and I suppose I understand why the natives didn’t seem as impressed with the ocean as I did to brave the cooler temps just to come to see the waves. Now don’t get me wrong, there is plenty of beauty in the vast farmlands and wheat fields of Oklahoma and Kansas where I grew up and lived for almost 40 years, but the Midwest lacks two natural amenities that scream adventure and call for folks to come to explore, the ocean and the mountains. When I was a kid vacation meant going to see my moms extended family in Virginia. Every summer we would cross the Appalachians on our way to Norfolk and Virginia Beach. On our way, we would often stop in the eastern part of Tennessee (Pigeon Forge) to shop and explore, or we would go visit Lexington, Virginia to tour the campus of Washington and Lee, where my dad (and later my sister) went to college. Stopping in these towns, I was exposed to the lifestyle of the area and would hear stories of the mountains and the areas surrounding. I loved coming to Virginia because the idea of being in the mountains one day, and the beach the next was so exciting to me. Fast forward to the present time, and I find myself living in Greenville, South Carolina, and just as I could as a child, I can be deep in the Pisgah forest on Saturday and basking in the sun at Myrtle Beach on Sunday. In fact, there are so many locations within a couples hours drive, in the almost three years I have lived in the area I am still learning of new places to go explore. I am also learning that not as many folks as I thought are taking advantage of the geographic wonders that are within reach and ripe for adventures. Now, maybe it is like San Diego and the “been there, done that” mentality kicks in, so the mountains and beaches aren’t as luring to a native Appalachian as to a transplant such as me. I also learned ( I own a gym and read research articles for fun) that the population in these areas are less active than most other parts of the country, something I thought would be the opposite(http://www.countyhealthrankings.org/explore-health rankings/rankings-data-documentation) . Whatever the reason, it seems as though we can all use a reminder of what this part of the country has to offer us. As mentioned above I am a gym owner and lead a very active life. I motivate people daily to strive to be the best versions of themselves. We operate with the motto “ train to live, don’t live to train.” Having big lifting numbers is fun, and logging a lot of miles is great, and both are needed for overall physical development, but that should not be the main goal or your training. Heart and lung health are why we train, but an awesome byproduct is a body that allows us to be more capable human beings. 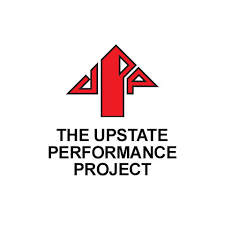 So in keeping with my desire to help people be the best they can and my desire to go out and explore, I am going to be highlighting areas all around Appalachia that offer excellent opportunities to be active and enjoy the landscape. I won’t be “reviewing” or “rating” trails and beaches, merely showcasing the different ways we can celebrate the area, and take our exercise on the road! 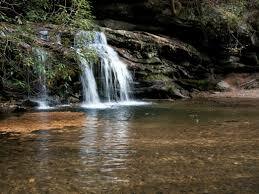 The first area I’d like to highlight is the Jocassee Gorges in the foothills of Sassafras Mountain. The Jocassee, or “ Place of the lost one” according to native legend, the area has so many places to explore. With over 43,000 acres this region is perfect for all types of outdoor adventures. A haven for scientists for years this region has many floral and animal species unique to the area. I recently hiked the Eastatoe Creek Heritage Preserve Trail, and it did not disappoint. A relatively easy trail to hike it is around 2.5 miles one way all the way to the gorge and offers great views the whole way. If you are just starting your fitness journey, the first couple of miles are relatively flat, with views of the peaks around the area. You could easily turnaround before you descend into the gorge and still have a great experience. If you are looking to step it up a notch, then hike down to the gorge a little over half a mile, and you will find some neat treasures. Along for the trek was my business partner and our four-legged hikers Mack and Sadie. 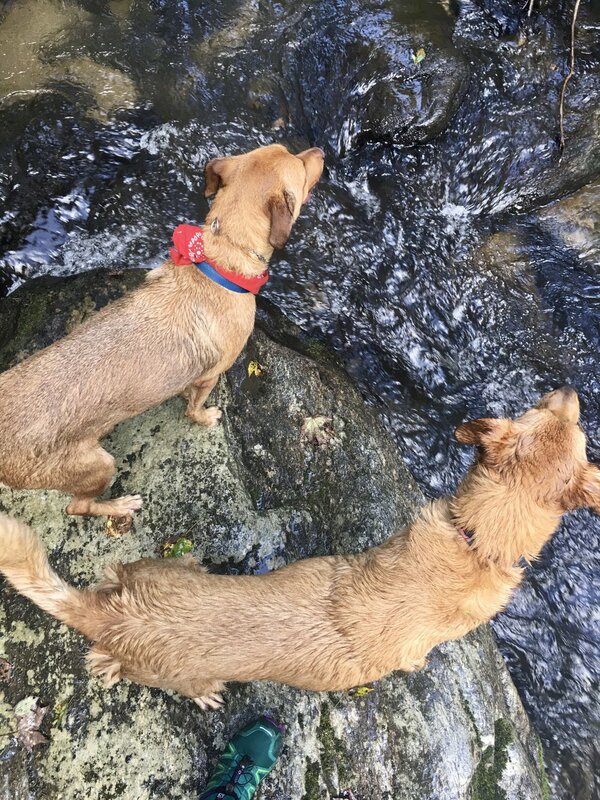 The pups enjoyed splashing in Eastatoe Creek, and we enjoyed the stunning view of the narrows waterfall (pictured). All said and done it was a quick 2-hour hike that we were able to do in an afternoon. I clocked around 14,000 steps so I know I got my fitness in as well! If you are not into hiking, there are jeep trails, fishing, swimming, among other activities. If you have not explored the Jocassee Gorges region make it a destination soon, with the leaves set to change and fall, I can't think of a better time to explore. 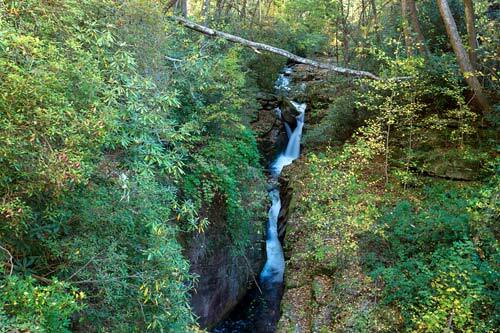 The gorges, Located in Pickens County, are not far from Greenville, Brevard, Clemson and make an excellent day trip. Life and fitness are both journeys with ups and downs, and sometimes it's nice to be able to go out in your backyard and reflect, and what an awesome backyard we all share.